[00:16:59] <tomp> "LatencyTOP is a Linux tool for software developers (both kernel and userspace), aimed at identifying where system latency occurs, and what kind of operation/action is causing the latency to happen. " [01:38:55] <Ziegler> custom m code? [01:54:20] <Ziegler> been trying to make some molds for it to reform waste into "bricks"
[01:54:53] <Ziegler> day to make a pinion? [01:54:59] <Ziegler> what are your current methods? [01:57:59] <Ziegler> got any pictures? [02:18:22] <jmkasunich> you mean the contacting surfaces would be jewels, or the block would pivot or something on jewels? [02:20:33] <jmkasunich> doesn't that risk dulling the cutter? [02:24:25] <jmkasunich> if you had a probe (as opposed to a v-block), how small would it need to be? 1mm sphere? 0.5mm sphere? [02:24:52] <jmkasunich> do you need to sneak in between teeth? [02:27:19] <jmkasunich> you say you use a microscope.... would optical methods work (webcam looking in microscope eyepiece) or is it something else that makes it a try-and-repeat process? [02:28:20] <tomp> can you 'look for daylight' ? [02:30:20] <jmkasunich> when you say not symmetrical. do you mean tooth-to-tooth variation on the cutter, and you have to find the biggest tooth? [04:25:12] <maddash> can someone look at the last row on page 3 of measure.igpp.ucla.edu/hemisphere/Manuals/ads7870.pdf and tell me what "aperture delay" means? [04:32:24] <maddash> is it the norm among a/d chips? [04:33:17] <jmkasunich> there is no such thing as "norm"
[04:34:33] <maddash> one benjamin for just one chip? [04:35:08] <maddash> what would they be used for? [04:37:06] <jmkasunich> what rate do you need? [04:37:11] <jmkasunich> how many bits of precision do you need? [04:37:20] <maddash> how would I know? [04:37:42] <jmkasunich> wtf are you looking at A/D converters for if you have no clue what you are gonna use it for? [04:38:11] <maddash> er, measuring voltage? 120VAC scaled down to 0-20V? [04:38:30] <jmkasunich> well, why are you measuring it? [04:39:03] <jmkasunich> how precisely do you need to measure it? [04:39:14] <jmkasunich> +/- 1V? +/- 0.1V? [04:39:51] <maddash> what about interface? isn't serial usually more troublesome than parallel? [04:42:08] <maddash> isn't SPI just some underlying protocol? what do you mean by built-in spi port? [04:42:21] <maddash> what quantity for the 978? [04:43:59] <maddash> isn't digikey aware of that? [04:45:03] <jmkasunich> do you have any clue what sample rate and accuracy you need? [04:45:19] <jmkasunich> why are you measuring the line voltage? for fun? to control something? to monitor something? [04:46:46] <maddash> scopes can take 20V? [04:48:27] <maddash> yow! the wires got so hot! [04:49:39] <jmkasunich> wtf were you thinking? [04:50:05] <jmkasunich> what wires got hot? [04:51:08] <jmkasunich> you have some circuit that takes the 120V ac, reduces the voltage, and turns it to DC? [04:51:27] <jmkasunich> and you want to monitor that DC with an A/D converter, or a scope, or whatever? [04:53:41] <jmkasunich> how can that possibly be part of a 120V to 20V circuit? [04:54:09] <jmkasunich> well, how many volts are you giving it? [04:54:55] <jmkasunich> why are you messing with chips like that anyway? [04:55:37] <maddash> what else would I work with? [04:57:33] <maddash> how's it 5V? [04:57:49] <jmkasunich> what, the LM2757? [05:02:22] <jmkasunich> free range doves! [05:14:43] <maddash> but can they run linux? [05:20:15] <maddash> er, higher priority numbers denote greater urgency, right? [05:20:22] <maddash> or the reverse? [05:24:27] <maddash> am I allowed to submit fixes for bugs that are already assigned to someone else? [05:27:06] <maddash> sweet. I'm going to be famous. [05:33:04] <seb_kuzminsky> servo people: can you recommend wires & connectors for motors & encoders? [05:34:35] <seb_kuzminsky> twisted pair even for non-differential encoders? run ground on the other wire of each pair? [05:43:58] <maddash> am I to understand that emc2 has no more than 17 open bugs at this time? [05:51:26] <brendanjerwin> First, anyone worked with the electronics from probotix.com? [05:52:13] <brendanjerwin> Second, does EMC have an equivalent to the automatic tool zeroing that Mach3 has? [05:57:28] <fenn> emc has probing and coordinate offsets..
[05:59:58] <brendanjerwin> is probing a general function or something specific to a single task? [06:13:28] <brendanjerwin> is that what you were asking? [06:14:08] <fenn> so the terminals are just along for the ride? [06:14:40] <brendanjerwin> I think the terminals are to allow for extensibility. [06:17:17] <brendanjerwin> fenn: what is the 5063 in your example? the offset of the tool set by the probe? [06:18:16] <brendanjerwin> ok, how did you know what value would be placed in 5063? [06:21:43] <brendanjerwin> I've just come to the realization that my concept that I'd be going quickly from CAD to milling without hand adjusting the g-code just isn't going to happen... :) I need to get comfortable with this stuff I guess. [06:22:22] <brendanjerwin> maddash: how did you know touch off does g10? [06:24:10] <brendanjerwin> yep, not a problem, just a puzzle. I have a lot of learning to do. [06:27:22] <brendanjerwin> is it common for people to use SCM packages (CVS, SVN) for g-code stuff? Is a g-code program something that is commonly tweaked over time, like a 'regular' program? [06:29:25] <toastydeath> not kidding at all? [06:30:43] <brendanjerwin> ah... I see. [06:32:13] <brendanjerwin> speaking of CAM; I was thinking of focusing on using CamBam. Any thoughts? [11:37:36] <alex_joni> how's your crap going? [15:12:35] <BigJohnT> which one goes where? [17:32:49] <dave_1> the only thing that has changed since yesterday is the temp of the shop .. probably down to 60. ... 23 degrees outside. [17:37:56] <dave_1> I wonder if it isn't a cold disk ... and it just shows up this way. [17:39:18] <dave_1> is anyone commenting on at_pid? [17:39:32] <cradek> the real error is probably in dmesg. could be "I can't find the motenc card"
[19:04:35] <dave_1> cradek most interesting ... same failure mode WITHOUT the motenc card plugged in! [19:09:18] <Jymm> SWPLinux: Uh oh... I was wondering why I heard the Haz Mat tem being dispatched. [19:10:03] <dave_1> soak up some of the garlic and acid??? [19:11:06] <dave_1> pancakes or coffee? [19:14:33] <Jymm> SWPLinux: There was this place that you can pay by the hour to use things like a mill, laser cutter, plasma cutter, etc, but I swear I can't remember the name nor find it in my bookmarks. [19:15:22] <SWPLinux> in this area? [19:15:27] <dave_1> I've got an interesting problem .. emc is shutting down ... on trying to load io ... shuts down before checking for card. [19:15:52] <Jymm> Yeah, Not in Santa Clara county, but someplace reasonably close. [19:22:48] <Jymm> In that photo, the gantry has been disconnected from the ballnut. [19:23:00] <SWPLinux> did you put it back in, or is that the old photo you had? [19:24:41] <dave_1> That Al 'U' that the ball screw is mounted in does't look too stiff. [19:25:16] <SWPLinux> or machine a new mount for one end and capture a pair of angular-contact bearings? [19:25:23] <dave_1> bearing are single taper roller? [19:25:39] <Jymm> dave_1: The U channel is more of a "dust shield" than anything else. 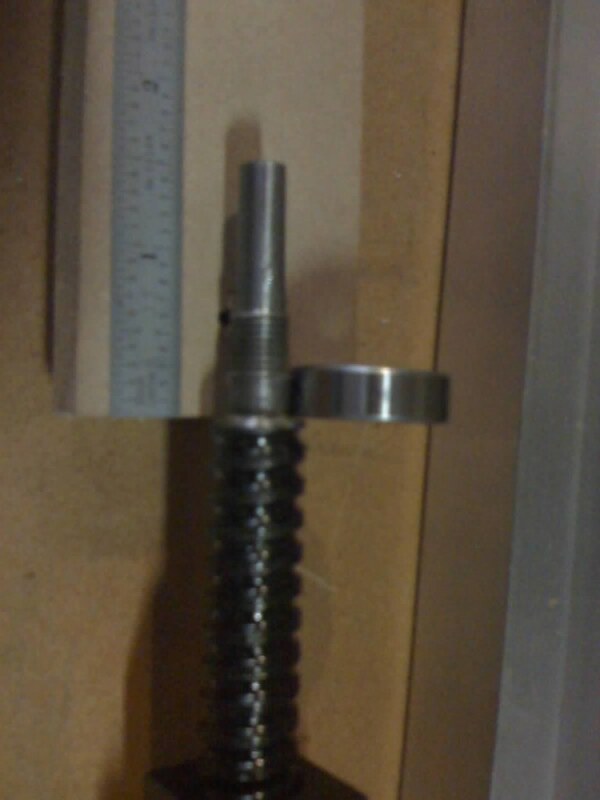 [19:29:49] <Jymm> SWPLinux: Since we were tlaking about it last night, I do remember measuring the threaded holes in the 80/20 and they were drilled/tapped correctly - no skew in them iirc. [19:30:06] <jmkasunich> dave_1: you still around? [19:31:01] <Jymm> SWPLinux: And when you move the underside gantry plate in place to attach the ballnut mount, they're pretty much aligned. [19:32:39] <dave_1> so comment out axes in core_ ? [19:35:44] <dave_1> mount ball screw ends in angular ballbearings or better yet high angle ball bearings. [19:36:16] <dave_1> secure with nut and spring washer so it is always tight. [19:37:00] <SWPLinux> so bearings tight to screw, but not necessarily to mount, like the "far end" of a BP? [19:41:50] <SWPLinux> oh... my... god! [19:43:14] <SWPLinux> well of course - HGR is open the third saturday of every month? [19:44:18] <jmkasunich> which model? #12? [19:44:38] <jmkasunich> how big was it? [19:44:56] <jmkasunich> smaller than a bport? kind of short and squatty? [19:51:55] <tomp> how does techshop handle insurance/liabilities? letting people off the street at a cnc mill, welder, ripsaw ! sounds like a great service, one i might use. [19:54:55] <jmkasunich> "them" = what? welders? [19:55:58] <jmkasunich> Jymm: what kind of bearings are you looking for? [19:56:50] <Ziegler> arnt skate bearing id pf 7mm? [19:56:50] <jmkasunich> 10mm ID, 28mm OD, 8mm thick? [19:57:51] <Ziegler> still too big? [20:00:26] <jmkasunich> 18mm long bearing seat? [20:00:29] <SWPLinux> is the 3200 series an angular contact pair? [20:00:39] <jmkasunich> do they have a long spacer on there now or something? [20:02:15] <SWPLinux> Jymm: can you measure the section of the screw that's 10mm diameter? [20:03:06] <Jymm> SWPLinux: In ebonics.... "we be fscked"
[20:03:43] <jmkasunich> this is a router, right? [20:04:25] <fenn> hi juanjo. have you made progress on your machining center? [20:04:57] <Jymm> On the end where the pulley would mount... From the should3er to the first thread .250"
[20:04:58] <jmkasunich> Jymm doesn't have a lathe does he? [20:05:14] <SWPLinux> Jymm: what about the other end? [20:05:19] <jmkasunich> Jymm: so 10mm diameter for 0.250 long, then threads? [20:05:55] <Jymm> Other end from shoulder to first thread is .350"
[20:07:56] <fenn> needle bearing + angular contact? [20:12:57] <juanjo> also i very confusing abouth a realible i/o i see the vital system DSPMC/IP interface, anybody kown if it i can use it with emc ?? [20:13:13] <jmkasunich> so where is the nut that is clamping the bearing? inside the bearing mount block? [20:14:24] <jmkasunich> so the screw is smooth, then threaded, then smooth again for the pulley? [20:15:40] <jmkasunich> how is the bearing retained in the block? its bored from one side, with a shoulder at the bottom? [20:17:52] <SWPLinux> why the recommendation for two needle bearings? Are those supposed to be at the same end of the screw or opposite ends? [20:21:17] <SWPLinux> double nuts so they don't come loose, or for another reason? [20:24:30] <juanjo> yes i designing one with a AVR and triger it at a interval by a pin of the emc. [20:25:34] <SWPLinux> sure, or a diode/capacitor + relay/transistor "switch"
[20:27:20] <juanjo> anybody have a idea the scan time spected for every pin, using a 1ghz machine??? [20:27:39] <SWPLinux> with what hardware? [20:28:52] <jmkasunich> do you need faster? [20:34:13] <fenn> ugh.. with multiplexers or something? [20:36:35] <fenn> jmkasunich: how do you clock them 8 times in one i/o cycle? [20:38:38] <juanjo> ok spi sound good also the shift registers!!!!!! [20:38:43] <SWPLinux> heh - phone camera? [20:38:45] <jmkasunich> SWPLinux: what was the problem that lead to thi discussion anyway? [20:39:09] <jmkasunich> lash? or things loosening up? [20:39:43] <jmkasunich> so the actual bearing is shot? [20:41:22] <juanjo> due the board is made to a round trip to the moon!!! [20:44:39] <tom1> wobble wobble wobble (not a turkey) maybe bearing not perp to axle? 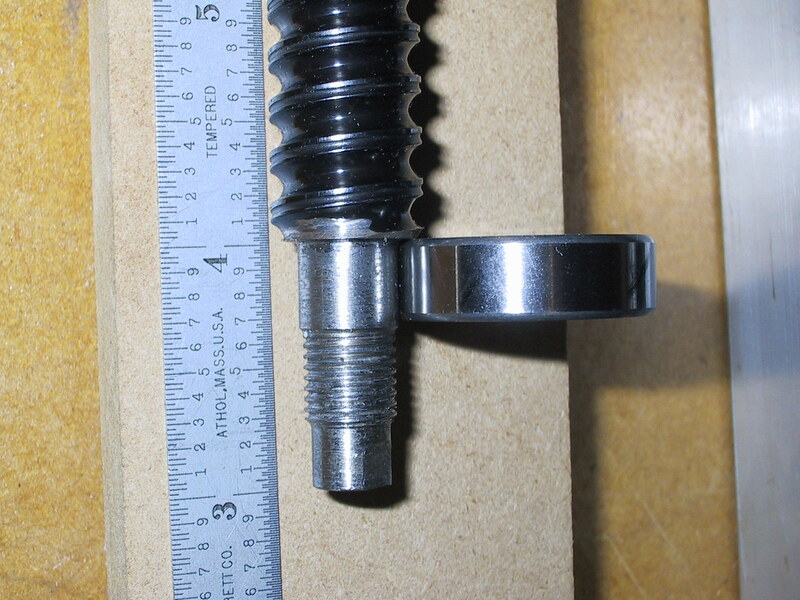 [20:48:05] <jmkasunich> 629 mearings from mcmaster hare the same OD and thickness, but 9mm ID - any chance of remachining the screw down to 9mm to leave a better shoulder? [20:48:51] <jmkasunich> does jymm even have precision tools? like a mic? [20:49:02] <fenn> jepler: can you just take the max of each? 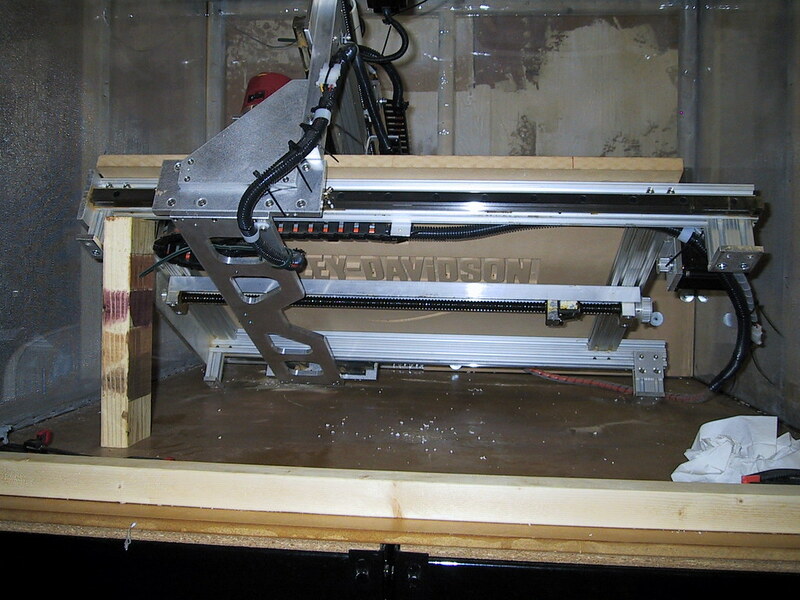 [20:50:34] <jmkasunich> who made this machine anyway? [20:53:40] <jmkasunich> what did the caliper say the bearing seat diameter is? [20:53:41] <BigJohnT> jepler: just wondering does stepconf use another file for the GUI part? or do I need to study it harder? [20:54:03] <SWPLinux> Jymm: got those calipers out? [20:57:15] <jepler> fenn: those would be the "more extensive changes"
[20:58:22] <juanjo> ok guys i left by now, i see later, thansk you by the support!!! [20:59:12] <SWPLinux> jepler: is there a version number in the stepconf-generated files? [21:00:08] <SWPLinux> the "quick-pick" selection is currently done with an index? [21:00:50] <jepler> I had the same problem with signal names on port setup, so for 2.3 I've used strings instead. but I won't make that big a change during 2.2..
[21:08:54] <jepler> anybody know offhand if the 4000/500/20000/1000 timings are OK for geckodrive 211 and 212? [21:41:20] <SWPLinux> washer to the screw? [21:41:51] <Jymm> I was able to sneak in that photo befor ethe battery died completely, it's charging now, then I cna take more. 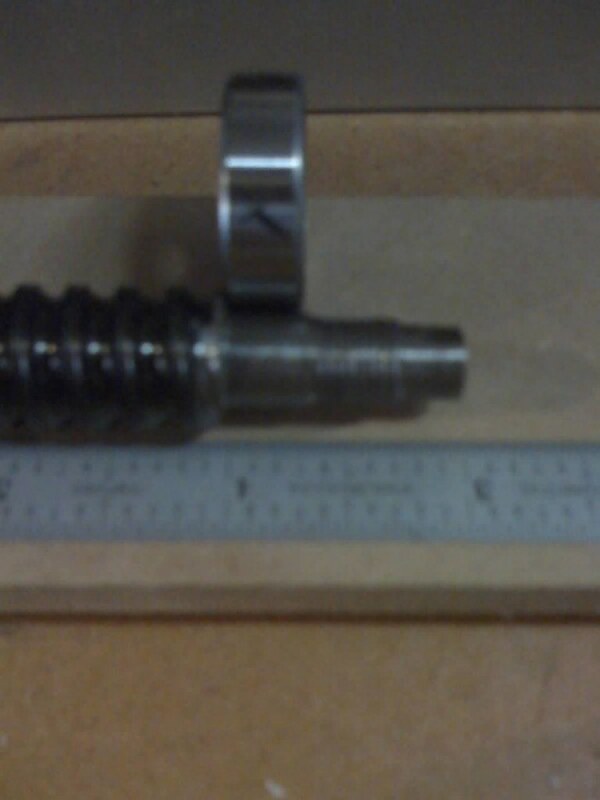 [21:46:44] <Jymm> SWPLinux: Not to mention their "FINE Precision machining" as you saw examples of yesterday. [22:09:01] <SkinnypuppY34> What was that ballscrew cut with ? [22:15:01] <SkinnypuppY34> Oh not the screw but the end ..
[22:16:44] <SkinnypuppY34> OMG that was as supplied? [22:27:24] <jtr> yes - otherwise, when the script ended, the environment variables it had created would go away. [23:08:53] <Gamma-X> gots a problem booting into the livecd from my other pc. [23:12:59] <tom1> does the boot screen say something like 'all actions recorded to blah.log'? [23:13:20] <Gamma-X> i dont believe so. [23:16:59] <Gamma-X> cant lol my cd rom on my pc now is sata. [23:18:01] <tom1> was old ide and new is ONLY sata? [23:18:44] <jtr> Is SATA supported in that kernel? [23:36:06] <tom1> did work, doesnt now? "hardware problem"
[23:36:45] <tom1> or do you mean it never worked with live cd and always works some other way?